There can surely be no more daunting prospect for a contemporary craftsman or designer than to be asked to create a new piece of furniture for one of England’s great historic houses. It is a delicious challenge, but the resulting creation will have to take its place beside other pieces of the highest quality, add something new and, at the same time, look as if it has a right to be there, part of the inherited ensemble. Some have argued that country-house collections have been too static and that we defer too much to the past. But two recent commissions show that the skills exist to design original new pieces that bring the same weight to a collection as a piece from the 18th century – that golden age of British craftsmanship – and bring pleasure to those who use them. Knowsley Hall has been in the Derby family for more than six centuries, although the present Earl, who inherited in 1994, had to bring the main house back under his control after it had been let to a police college for 40 years. 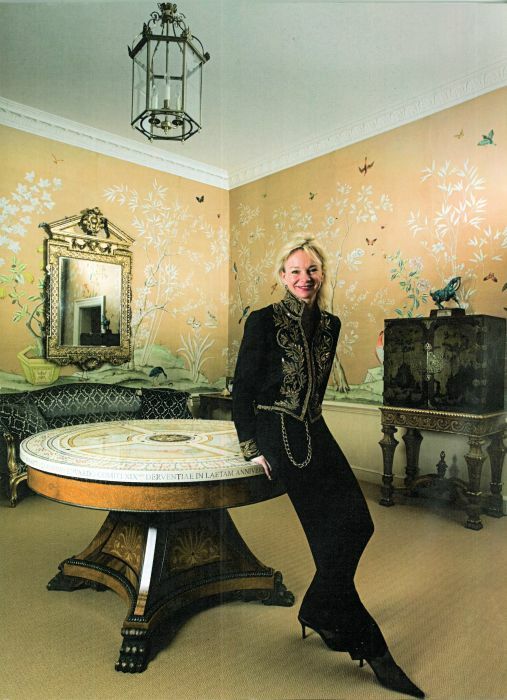 Thus, the new centre table, which the Countess of Derby commissioned for the garden hall of the 1960s neo-Classical house on the estate as a surprise 10th wedding anniversary gift for her husband, takes its place in the larger story of the house’s revival. It was intended to celebrate all that Lord Derby had achieved in that decade. ‘I wanted a piece that would record his achievements pictorially – to be a visual congratulation. I am so proud of what he has done,’ says Lady Derby. Mr Messel designed a round table in the late Georgian neo-Classical spirit, the base in rippled walnut, amboyna and satin-wood, with ormolu and bronze mounts and feet (modelled on the crest of the Braybrookes, Lady Derby’s family, ‘an unexpected surprise from Thomas,’ she says). The cabinetmaking was done by the firm Jonathan Rose, largely by one of the senior men there, Stuart Crowhurst, and the table has neatly concealed drawers for visitors’ books. The bronze feet were modelled by Peter Walwin, and cast by Whiteway Craft in Gloucestershire.